Frog is feeling mighty bad, mighty sad, and mighty frustrated. He wants to be a singer, but in the forest where Frog lives only birds are allowed to sing. After much practice on his lily pad, one day he says to himself, "I'm tired of holding all this inside me. I want to sing. I can sing, and I'm going to be a singer!" What happens as Frog sets out to achieve his dream surprises everyone, including Frog himself. Full color. A frustrated amphibian with a dream propels this picture book about the power of self-confidence. More than anything, Frog longs to belt out his soulful songs before an audience. However, the birds are the only beasts in the forest to land a singing gig, and-along with most of the other animals-they laugh at Frog's aspirations. ("Fool, you crazy?... Frogs don't sing in this place"). But buoyed by his parents' support and his need to express his talent, Frog books himself at the Big Time Weekly Concert, where, after an embarrassing bout of stage fright, he lets loose with a boogie-woogie solo. A huge hit, he inspires a number of dance crazes among his fans. Goss's (coauthor of Talk That Talk) chatty, laid-back, blues-infused storytelling ("Have you ever been frustrated? That's right, I said frustrated. Tell the truth now") immediately wins the attention of readers, and her sympathetic tone leads children through the somewhat lengthy text at a good pace. Jabar's (No Hickory, No Dickory, No Dock) vibrantly colored scratchboard characters on black backgrounds take center stage. Such spirited yet sweet scenes as Frog crooning with eyes closed and a huge grin on his face, or parting his "hair," and elephants gleefully doing the bump are particularly memorable. An author's note discusses the African roots of blues music and its offshoots in American popular music. Ages 4-8. Linda Goss was born near the Smoky Mountains in an aluminum factory town, Alcoa, Tennessee. She grew up listening to the storytelling of her grandfather Murphy, who shared stories of life under slavery as well as a heritage of folk tales. She continues to tell some of the stories that she learned from her family. 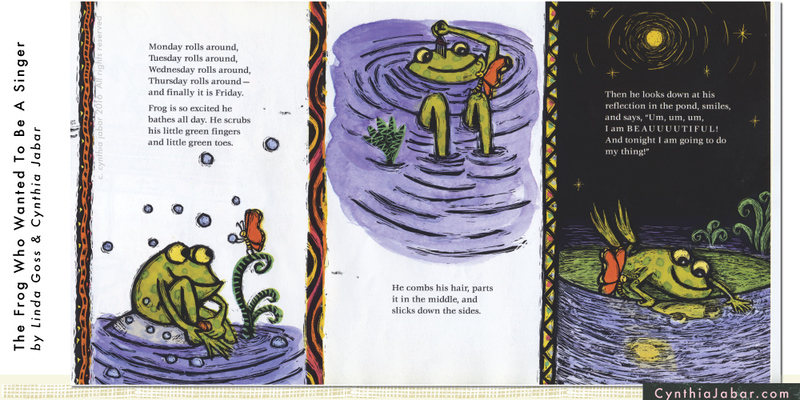 (One of her children’s books, The frog who wanted to be a singer, is a retelling of her father’s favorite story). Her education in storytelling began in her family— in the way that her grandfather told stories ("He would always tell a story by asking a question. . . . He would make voices, imitate characters, make faces. . .) and in the repertoires and narrative habits of other family members and neighbors. Her grandfather told stories only to Linda and her brother. A strong and harsh man, he was, however, the subject of many stories both inside and outside the family, and Linda came up learning this heritage of family folklore, oral history, and legend, as well. Stories about ethical values, courtship, the civil rights struggle in Tennessee, stories from personal experience, and play-party songs, and hundreds of stories that she has gathered over decades of serious study and performance of stories, are now in her repertoire. She has been named the Official Storyteller of Philadelphia. A pioneer of the contemporary storytelling movement, she was co-founder of "In the tradition. . ." the National Black Storytelling Festival and Conference, and The National Association of Black Storytellers, a founding member of Keepers of the Culture (a Philadelphia-area affiliate of NABS), and of Patchwork: a Storytelling Guild, the author of numerous books, and a contributor to numerous collections on African American storytelling. She has two Folkways recordings to her credit. She performs widely. She is the recipient of the 2003 Oracle Lifetime Achievement Award in Storytelling from the National Storytelling Network, and has received a grant as a master artist to work with an apprentice, through the PA Council on the Arts. She holds an undergraduate degree from Howard University, Washington, D.C. and a Masters degree from Antioch University. She has been an Artist-In-Residence at the Rosenbach Museum, and at PFP. She was a featured artist in the Humanities on the Road series produced by the Pennsylvania Humanities Council. Watch a video clip here.